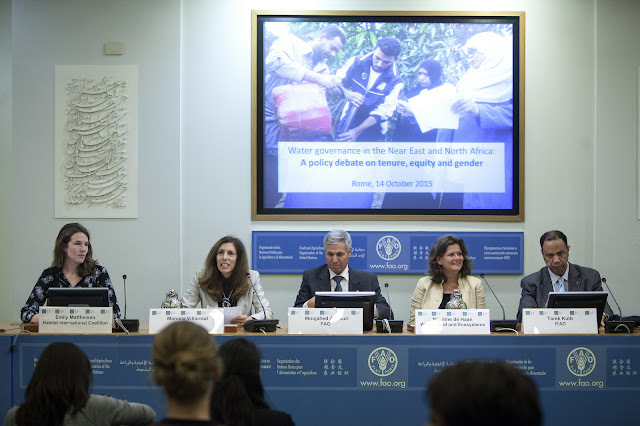 Women and water governance was the topic of the well-attended panel discussion "Water governance in the Near East and North Africa (NENA): A policy debate on tenure, equity and gender." - 79,017 women benefited from the provision and improvement of water resources, which reduced distances of fetching domestic water (from 8 km to less than 1 km) and resulted in time savings (of 1 to 5 hours per day) that allowed women to access credit and extension services, engage in agricultural work (mainly sorghum production) and diversify sources of income. This led to 43% increase in productivity, improved availability of food, and greater food security. Women were able to spend more money on the education of their children, acquire assets, and improve household hygiene and nutrition. - Greater decision-making power through women's participation in water committees: women now represent 38% of water user associations' members. This was achieved by applying a quota system to ensure no less than 30% involvement of women in committees, water user associations and other local organizations. Held as part of the 42nd meeting of the Committee on World Food Security in Rome on 14 October 2015, the side event explored the impacts of water scarcity in NENA region, and the role institutions can play in giving women more rights to key natural resources (land and water) as well as opportunities to exercise these rights. NENA is the most water-stressed region in the world with 609 m3 of water available per capita per year. By 2045, this area will experience an expected water deficit of 60 per cent, owing to the combined effect of rapid population growth and climate change. What will the region look like by 2050? How can society and communities be prepared to adapt to this change? What present practices do we need to change? These were some of the key questions that emerged at the panel discussion. Why look at water governance through a gender lense? Many factors make women well-adapted to play a role in water management. As men increasingly leave degraded rural areas to look for jobs in urban centers, women are left behind. The percentage of women in the agriculture labour force has risen sharply, faster than in any other region in the world. As a result, women are affected first — and most — by water scarcity and flooding, and tend to be gravely impacted by poor water management. But women also increasingly hold the decision-making positions that were traditionally occupied by men. -Water supply for 13,748 households with roof rain-water harvesting (individual and group) reservoirs for drinking, domestic and irrigation uses. The construction of the reservoirs was done in a participatory way in dry mountain areas. It resulted in time savings (2 to 5 hours per day) that allowed 16,000 women to complete literacy classes (including Training of Trainer programmes for some 2,200 women in sewing, handicrafts, midwifery and other topics) and some 3,400 women to train in first aid, hygienic use of water and general health. -Income-generating activities. Thanks to the time saved on water collection, more attention could be given to home gardening and backyard chicken raising: they became a vital source of household nutrition and women's revenues. -Better resource management was achieved through 25 rangeland management groups with 125 members each (35 women and 90 men), and 10 ha rehabilitated thanks to 11 nurseries. Women were introduced to environmental actions, including nursery and tree planting techniques. However, the specific needs and priorities of women as farmers and agricultural water users are still not reflected enough in sector policies, legal frameworks and programmes. If women could participate on an equal basis in decision-making processes about water use and management, women's contribution to agricultural production would ultimately increase. Ultimately, we believe this would lead to better food security and nutrition as well as more sustainable management of water resources. Because rural women have local ecological, social and political knowledge, they can both inform and contribute significantly to solving water-scarcity problems. Hence maximizing the role of rural women in water governance and food security is essential. Work by FAO and others demonstrates that water access and use are not only influenced by infrastructure, rainfall and geography. In fact, social, political and economic power relations within and among countries are just as important. "For women, access to water is always mediated, either by technology or by society", said Nicoline de Haan, Senior Researcher, CGIAR Research Program on Water, Land and Ecosystems. In the context of water scarcity, women's capacity to access water depends on a system of power relations, and existing access rights. Interventions should look into enabling women to fully engage in local development processes. -Targeting women. Women headed-households comprised 15% of all settlers' households, and women comprised 61% of recipients of training in nutrition and health, 55% in environmental awareness, 81% in literacy, and 20% of cooperative and community training. 10,229 women were trained in agriculture and water management, and 2,729 women participated in demonstration field days. -Conversion of 36,000 feddans (eq. to 15,120 ha) to drip irrigation resulted in annual water savings of more than 50 million m3 in the main project area. The water savings also contributed to better natural resource management, savings in fertilizer use (40%) and reduced use of pesticides, thereby contributing to reduced pollution and improved environmental quality. Overall savings for the farming community amounted to USD 1.5 million in annual irrigation costs (electric power and labour). "Strengthening water governance for agriculture and food security for women" means adopting an effective problem-solving approach to develop policies and strengthen institutions that are accepted by all relevant stakeholders. Tarek Kotb, Country Programme Manager, Near East, North Africa and Europe Division, IFAD, presented some experiences from the field that have had a positive impact on women's empowerment, when it comes to tackling the issue of water governance and food security in the region. These projects illustrate ways in which women are taking on new roles to tackle water-related issues, including adequate management of natural resources (WSRMP, Sudan); rain-water harvesting (ACRMP, Yemen); drip irrigation (WNRDP, Egypt); and grey water management (ARMP-II, Jordan). -Greywater treatment units in backyard gardens of 800 to 4,000 m2/household enabled households to treat domestic wastewater, and use the treated water to grow vegetables in their backyard gardens. This led to 16.3% savings in water consumption and to nearly 70% less sewage effluence. -A total of 400 Jordanian households (3,000 people) – including 13 women-headed households received these subsidized grey water treatment units, as well as technical guidance. -Income increased by 72% from sales of farm products: mainly from olive trees, and in some cases from fodder and nuts. Documentation is generally missing to understand the challenges women face, and which tools and approaches would be the most appropriate to address these. Here, research has a definite role to play. Currently "women" tend to be considered as a homogenous group. Research can play an important role in correcting this idea. In fact, women constitute a diverse group. Thus they are also diverse water users, who face diverse challenges. Institutional changes, including the corresponding regulatory mechanisms, are required for local institutions to include greater gender equality, so that women can better engage in multi-stakeholder processes. Implementing meaningful participation processes will be essential to empower women to take on decision-making positions. Climate change will create additional social tensions and imbalances for women. In particular, the increased climate variability may negatively impact their resilience capacity. Responsible investments are needed to bring about sustainable changes. Elements of success that were identified relate to: building on political willingness and adequate incentives; mobilizing local champions; reaching out to the private sector; and empowering civil society to play its role. Blog on water rights: Taking the lead or imposing inequity? 2015 Report of the High Level Panel of Experts on "Water for Food Security"